Comment: UTA says the system is too packed to have free ride days. While that is true on TRAX there is tons of extra capacity on the bus system. They should have free ride days on the local buses for sure. December means once again the Utah Transit Authority has started up its ski bus service that runs from Downtown, a couple of TRAX stations, Park N' Ride lots up to the ski resorts in Big and Little Cottonwood Canyons. While the effort to get people up to the ski resorts in a safe way is great, at what cost is the current ski bus service being provided? While the yearly reports from the UTA do mention the sales tax revenues for the ski resort areas, they do not show the route by route cost of the service or they do not mention the cost of lost opportunities. A perfect example of the waste is the ski buses themselves. Most of the ski buses have sat since the bus service ended around April. That means for 8 months the buses sat being unused and not turning a revenue mile. The UTA does alternate the ski buses on the twice daily trips to the canyons during the summer but that is still means they sit way too much. In many ways UTA (and other transit agencies) have way too much in common with Amtrak. Amtrak is one of the biggest waster of assets around. One of its biggest problems is that its trainsets spend way too much time sitting. Can you imagine Southwest Airlines or any other airline for that matter having a major asset sitting three quarters of the year??? This once again shows how the management of transit systems including UTA are disconnected from reality. One of the causes of this is that UTA only pays a small fraction of the cost of the buses and gets free money for the rest. If UTA had to pay all of the cost of its buses do you think they would be sitting for eight months? The high priced MCI Commuter Cruisers are no different. While some of them may see all day service, a majority of them make one trip from their location to Downtown Salt Lake City, sit all day and then return in the evening. Here you have the most expensive buses in the UTA fleet and they are not earning their keep. UTA needs to put its assets to better use. The Ski service should be examined and see that it is worth the cost. Last year the UTA got a lot of flack for its service offered on some holidays or the lack thereof. This year service improved but there still issues that need to be addressed. One perfect example is the service that was offered today on December 26. Because the 25th fell on a Sunday many companies and of course the government considered the 26th to be a holiday and took the day off. The Utah Transit Authority ran Sunday bus service today instead of weekday. This is a perfect example of how the UTA board of directors and the higher up employees are too disconnected from the customers that they are responsible to service. While they may have had the day off many of their customers did not but had very few options in getting to work. UTA still has a extremely limited service on Sunday which for the most part is useless making it impossible for many of their customers to get to their destinations. However UTA still provided a normal schedule for the ski routes despite not providing adequate service for their every day riders. Most transit systems at least provide a Saturday Schedule on days are unusual holidays. That way the people that still work normal hours are able to get to their jobs. This would have meant that most bus lines would have been operating today and a greater percentage of the customers would have had service. UTA needs to make a better effort to see what their customers needs are. The UTA is planning to test a new "contactless" fare system starting on the ski buses and eventually spreading to the entire system. The general idea is to make fare payment easy and more comfortable for the riding public. While it is wonderful that the UTA is trying to do things that will make riding the system easier which should be one of the primary goals of the organization, trying an untested fare payment system, even if its limited to a certain service, is just asking for trouble. The is the problem with organizations that have too much free money and do not have to worry about making a profit. Many times the only thing transit authorities seem to care about is having the latest and greatest, and not looking at the potential problems with unproven technology. We have seen time and time again where a transit agency has tried something completely new that has not been test and it has been a complete failure. Early experiments with automation with such systems as BART are a perfect example. Another example is Amtrak's Acela trains that have never performed the way they should have but they line peoples pocket books. UTA: let someone else try this out and make sure it works before spending precious dollars on a possible lemon. This article from the Deseret News talks about the development at Daybreak and the other plans that Kennecott has to develop the west bench along a proposed light rail corridor. While the development is wonderful, and I myself would love to be able to buy a house in the Daybreak complex since I do enjoy what they are creating there, how about all the other potential along the TRAX lines that already exist. There is a proposal to build condos and townhomes at the Sandy Civic Center station which is the first of a planned development around that station. In addition there is proposals to greatly change Murray with the redevelopment of the area around the 4500 South TRAX station. However many of these projects are moving slowly. The cities and UTA need to be more aggressive in developing Transit Oriented Development along the TRAX lines. Maybe if Mayor Dolan of Sandy would stop his love affair with big boxes that ultimately cost the tax payers more in services, and start looking at what is best for the community in the long run, he would start paying attention to TRAX. There is a gold mine waiting to be developed, the cities need to take charge and start working toward developing it, and making it happen. One of the few things the Southern California Rapid Transit District ever got right was renumbering their bus lines in the early 80's. Before then many of the route numbers where either from the private companies that came before it or numbers that just happened to be available. After the route renumbering all you had to do was look at the route number and you had the general idea of where the bus was going. While I have not seen the UTA's plan for restructuring the bus system (boy are they keeping that a secret) here is my idea on renumber the bus routes in order to make the bus system easier to understand and better for the choice riders and first time riders it needs to reach. One of the problems of the present system is that once again many of the route numbers are from the streetcar days and have no bearing on today's world. This renumbering system would make the UTA even easier to use. With the growth in Utah and Weber Counties you could even break up the routes further when more routes are added in the father reaches of the counties. Also, this route renumber would leave plenty of room for the expansion of bus service in the future. Image by Bill.Roehl via Flickr For those of you who didn't know about it or didn't see it, the BRT or 'Bus Rapid Transit' dog and pony show rolled into town a couple of weeks ago once again proclaiming that BRT is the transit answer and how it is a cheaper alternative to Light Rail. Nothing could be further from the truth. Actually in most cases BRT is more expensive than light rail if you look at comparable systems. The only problem is that when BRT is compared it shows a system with less features that light rail. However few BRT schemes are actually comparable to light rail so its impossible for people to see the price difference. The only BRT scheme that has come close to the true nature of Light Rail is the new Orange Line in Los Angeles however it still has to deal with traffic lights instead of grade crossings so it is also no where close to light rail. Although ridership looks impressive right now they it is still impossible to determine if the ridership is all from the neighboring bus routes. Ridership is also less than impressive with most new BRT lines. The line in Kansas has attracted little ridership, the Las Vegas system is carrying only a fraction more people than the buses it replaced, the Harbor Freeway busway in Los Angeles attracts few riders, and ridership on the El Monte Busway in Los Angeles has been stagnant for years. In addition busways in Philadelphia, Pittsburgh, and Miami have failed to live up to expectations. At least in Salt Lake County UTA is using BRT where it should be, in corridors that would not see TRAX in the next 30 years. 1300 East, Redwood Road and 3100 South are perfect areas to have BRT. BRT is not a low cost alternative to TRAX, it is a supplement to the TRAX system that can be an effective system of feeding riders into the much more popular TRAX system. Well it looks like the December service changes will have little effect on most riders. The Ski Bus service starts up again with some realignments but otherwise there is little change. The biggest change will the the lost of bus stops along 700 East. For many years during rush hours, buses traveling in the rush hour direction would run as limiteds from 900 South to 4500 South making stops only at signalized intersections. However the bus stops where never properly marked as which stops would be served and which ones where not which created confusion amoung riders and created a lost opportunity to create new riders. Now instead of fixing the problems with the existing service, the UTA has made the unilateral decision just to cut all the non signalized bus stops along this route. So instead of making a bad situation better they decided to make it worst. What would have been a better solution to the problem was to make one of the 3 routes that service 700 East a local route and make the others limiteds. The 27 would have been the ideal candidate to make a local route while the 21, 32, and 44 should have all been made full time limited stop routes. Once again UTA is looking at numbers and not considering their riders. They need to make the transit system friendly in order to capture the choice customers. The people making the decisions do not ride the bus enough to understand the needs of the riders. Too often they look at charts made by computers and do not understand why things are they way they are. There needs to be a change of thinking to improve the UTA. With the Park City area experiencing rapid growth including the areas around Heber, the time has come to offer commuter and transit service from the Summit County areas down to Salt Lake including the university of Utah and Downtown Salt Lake. At the present time Park City has its own transit service which provides free bus rides around the Park City area. Currently Park City is not part of the Utah Transit Authority and should not become a part of it. In my previous entry: Time to Split Up the UTA? I proposed a new transit authority that would oversee both the commuter bus and commuter rail operations of the UTA. This new outfit would be perfectly suited to offer commuter bus service to the Park City and Summit County regions. As the region grows and traffic becomes a bigger issue, the need for effective transit service will become even more evident. Not only could Summit County be linked to the Salt Lake City but also routes to the Provo area and up to Ogden via Echo and Morgan would be natural extensions of the service. Service to Salt Lake City could service the U of U, Downtown, and the airport although private bus companies will scream bloody murder because it will effect them. One way to take care of this situation is to have the service contracted out to private operates, so long as there is monitoring of service quality to ensure customers are being treated fairly. As Utah continues to grow, it needs new ways to deal with growth. An effective transit system is at the heart of that. Time To Split Up the UTA? Is the UTA trying to juggle to many eggs? It seems like recent actions by the organization clearly shows that there needs to be organizational change at the UTA. One of the problems with the organization is that it is just too big and is having a hard time answering to the needs of three counties. Its is time to look at breaking up the UTA into three or four different organizations. The first couple would run bus service is the North Davis/Weber County areas. The second would be in charge of bus service in Utah County. The third organization would be in charge of bus service and TRAX in Salt Lake and South Davis Counties. This would allow boards to oversee their counties and the organization would be more responsible to the customers it serves. The big question mark would be what to do with the commuter rail and bus service. 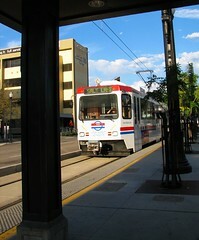 One possibility would be to create a fourth organization that would run these services since many of the customers who ride these buses and will ride the commuter rail system will not ride the local bus system except for a short ride in say Downtown Salt Lake which should be in the free fare zone once commuter rail starts. One of the biggest arguments that comes out of these proposals is that its balkanizing the system and making it harder for people to commute. These issues can be easily solved by creating a uniform fare structure and creating agreements before the split that requires joint fares. The benefits of splitting up the system is that people in thier respective counties would have better representation and have a bigger voice on how the transit system is run. It is clear that there needs to be changes with the UTA. This is one change that gives local customers better service and better representation. Image via WikipediaWell it looks like the riders of the UTA are getting a reprieve from the fuel surcharge that the UTA proposed putting into effect on December 1. It turns out that the agreements for some of the special passes that UTA has would not allow them to put on a fuel charge. But rest assured the UTA does plane to put the fuel charge in effect in June when the existing agreements end and new agreements can be worked out. At the UTA board meeting on Wednesday 10 advocates for the poor protested the surcharge but that had little bearing on the decision by the UTA. It was interesting that one of the board members pointed out that the surcharge will not be charged on paratransit service. This is despite the fact that paratransit service is the mostly costly of all bus services and truly is not a transit service but instead a taxi service. Also some have complained that the surcharge will also be on TRAX despite the fact that TRAX does not use electricity. It looks like 2006 still will not be a good year for the riders of the UTA. January 1st brings in the already approved fare increase (wasn't the fare increase to offset higher fuel prices? ), then in April they will cut bus routes which they haven't announced what will be cut, then in June the fuel surcharge takes effect. Its just enough to make choice customers make a choice back to their cars. -Route 7: Discontinued-it runs along the same route as the 11 for much of the way. Of course one of the problems with this pair is that as I have mentioned before, the buses run a few minutes away from each other instead of providing coordinated service. So if the 7 goes, it can be laid directly on the incompetence of the UTA planners. -Routes 5 and 13: One of these routes might end up on the chopping block due to duplication on parts of their routes. The truth is the whole eastside bus service needs to be reorganized by it most likely will be reorganized in a customer unfriendly way since the consultants usually just look at numbers and don't look at reasons behind the numbers. -Routes 35 and 36: Truth be told these routes need some reorganization. They meander throughout the West Valley are but only run ever hour which is not enough service to build a customer base. The only problem is that there needs to be some new service out there primarily more north-south routes travel on streets such as 4000 West, 4800 West, 5600 West and so on. -Routes 24, 33, and 222: These routes may see some cuts too although the 33 is already hourly and none of them run on Saturdays anymore so there is not a lot left to cut. One of the big problems with the system is that there should have been major revamping when TRAX was started and when the University Line opened. However what was done instead was to cut the routes at the nearest TRAX station instead of a comprehensive revamp of the system. A perfect example of the poor cuts was the 33. The bus is so far away from TRAX at 1300 East and 6600 South when he starts heading there, people on the bus at that time would be in downtown if they bus headed directly there by the time they catch a TRAX train. It is too bad that what cuts are proposed will go back to the fact that the planners have failed in their job. Why should UTA's customers be hurt because of poor planning? Image by pbo31 via FlickrNot only is UTA going to give you two fare increases in the next couple of months, it also plans to give you another present in April: Bus Cuts. While not planning to implement its mysterious bus changes yet because of issues downtown, it does plan to cut some routes in the spring shake up. So far UTA has not said what routes it plans to cut, only that notices will be posted on the buses system and TRAX. Most of the time they never publish any of the proposed changes on the website or where the meetings to talk about the cuts will be. Last year when they discontinued the 12 line, there never was any notice published in the news section of their website. To top off it all off, not only are they raising fares and cutting service, the fuel surcharge that every one will pay will not go in effect on Paratransit Service despite the fact that it is the most costly UTA service that is more taxi service than transit service. Once again this clearly shows that UTA doesn't have a clue and doesn't truly care about attracting choice customers to the transit system. Image via Wikipedia Well it looks like UTA is going to implement a fuel surcharge to cover the cost of fuel that is escalating and despite prices for gasoline going down recently, the price of diesel is actually going up. However, while the UTA is incurring additional the cost, the fuel surcharge is the wrong way to about collecting revenue. What UTA plans to do is charge an additional quarter to all riders. That means that even pass holders will have to fork out a quarter every time they ride even after they go to the trouble of buying a pass. The UTA needs to be making the system easy to ride in order to encourage the choice customers to switch from driving to taking the bus or TRAX. If the choice customers find it too hard to use the system they will go back to driving their cars. The fuel charge will drive many of this choice customers back to their cars. To make it a double whammy, not only are they going to start charging this fuel surcharge in December, then the following month they are going to increase regular fares by 10 cents. How what a Christmas and New Years presents the riders of the UTA are going to get this year. Once again, the people in charge of the UTA are not thinking out of the box. They are doing nothing to encourage increase bus ridership to offset the increase fuel prices. UTA needs to start thinking out of the box and stop this dumb programs that only hurt ridership not increase it. 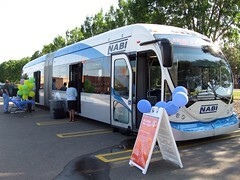 Image via Wikipedia On my recent trip to Las Vegas, in addition to riding the Monorail I also had the opportunity to try out the other great transit experiment, MAX which runs from Downtown to North Las Vegas. This is a Bus Rapid Transit service that has been highly touted and used as an example of a light rail "like" system but of course for less money. The line uses dedicated traffic lanes for part of its journey along with million dollar buses that use Hybrid technology. The system also has Proof of Payment fare collection, and makes limited stops. I will not discuss ridership numbers on my trip since it occurred on a Saturday, but in Las Vegas that should not play a role in the numbers. The first thing you notice is that the buses are slightly quieter than a normal bus but in no way is comparable to electrified operation of light rail. In addition you still get the road noise and other problems associated with rubber tire technology. The buses are equipped with an optical sensor system so that when the bus approaches a stop the system takes over the steering and steers the bus to a perfect stop. Great concept that just doesn't work in reality. Because of the drifting sands of the area the optical sensor system has never worked and would not work in area that gets snow (ie: Utah) either. Unlike the monorail this system is run the CAT the local bus system and does use normal cat fares, transfers, and bus buses. They have been touting the great ridership increase but in reality less than a thousand new riders are on board on a regular basis. When it comes down to it, MAX is nothing but a glorified bus and many local residents I talked to see it as nothing but a glorified bus. It is not attracting the choice riders that Light Rail does but does serve a purpose of getting people along the corridor faster. However, the Limited bus that used to serve the area did the same thing at less cost. Much like the monorail, the MAX system is all glitter and no gold. Image via Wikipedia While I do not see a good transit ideas coming out of Vegas, there is one project they are doing that UTA should look at and implement. The service is called Silver Star service. The concept behind Silver Star is that it runs from Senior Citizen housing and other senior citizen buildings to major shopping destinations in the area. The routes only run a couple of times per week, they run primarily from 9:00am or so to about 4:00pm so they are not out at rush hour, and they use small cutaway vans since they go into the parking lots of major stores and small apartment complexes. While these services primarily target senior citizens, anyone can ride the buses and they are equipped with wheelchair lifts. The service has been successful and has grown from one route to 11 in only a few years. This service is an excellent idea and should be tried here in Utah. There are many seniors in housing that are fearful of riding regular transit especially with walking to it. Both Las Vegas and Utah have many bad drivers and being a pedestrian in either area is dangerous. This will allow seniors to ride the bus and not have to worry about crossing dangerous streets. Like in Vegas, the buses could run a couple of days per week on each route, and serve and many locations as possible within an hour time frame before being back at the origination point. Most of Salt Lake city could be covered in a couple of routes then find the best places to put a couple of routes in the suburbs. UTA needs to be looking at innovative transit ideas like Silver Star. It serves the population that needs transit the most and is very useful for others. It serves a market that is waiting for good transit service. Image via Wikipedia If you lived in Salt Lake City before the first TRAX line opened in '99 you may remember that there was a big campaign by the monorail folks to saying that a monorail should be built instead of light rail. What was interesting about the campaign is that it was run by some group that had offices in Seattle, Salt Lake City, and one other city and called the Wilmore Group. What was interesting about the whole thing was there was no website for the company and if you wanted to contact their Salt Lake office you could only get a recording or send a fax. Well Salt Lake went for Light Rail and it has been successful. However the monorail folks did have two successes although one of them is in financial trouble now before turning a lick of dirt. Las Vegas now has a monorail operating and Seattle approved funding for theirs but there is many issues now. The Las Vegas Monorail opened last year only to be closed for some time because of a drive train falling from one of the trains (that can hurt!) and reopened right before the first of the year. The Seattle folks used the Las Vegas monorail as a example of a transit system that could be built and run without support from the taxpayers and used this example in getting voter approval for the Seattle proposal. Of course this does not take into account that Las Vegas is unique and that the casinos payed for portions of the line and that the financing package just wouldn't work in most cases, but has been used to bash light rail lines. 1. Most of the ridership rides from the MGM stop to the Harrah's stop which is the last one on the strip. Few people rode beyond to the Hilton and the Sahara but that changes when there is a convention in town. 2. The monorail does not have smooth ride. While there has been some criticism of Light Rail because it bounces some, it is much smother than the ride on the monorail. It sways back and forth severely and will give some people motion sickness. 3. Wynn has a shuttle from the Convention Center station to The Wynn Resort and it is actually buses. So people who can afford the Wynn will ride buses!! However the bus station is across the street from the escalator to the monorail. 4. There is very little coordination from CAT to the monorail but since this is a separate system and has nothing to do with CAT there is obvious reasons why. However if it does get extended to Downtown there will need to be better coordination between CAT and the monorail. 5. One of the reasons monorailist use to justify a monorail line is speed, but don't look for it in the Vegas monorail. It automated message brags when it hits 50mph! (TRAX can go up to 55mph and some other systems can go 65mph). 6. It doesn't take much of a load before it is SRO. There is not much seating available on the monorail, plus it has fixed consists which means it can add cars easily like light rail, so even small loads overwhelm the cars. While monorail may have a purpose, it is designed mainly to be a feeder in dense urban areas. If you look at many Pacific Rim countries they have monorails that feed into other transit systems that handle the main commuting. What monorail is not the greatest thing since sliced bread that many make it out to be. UTA to Cut Service and Increase Fares??? Today the UTA board is meeting to discuss the possibilities of raising fares and decreasing service due to the increase in fuel prices and increased ridership. OK, they are getting more riders, which should be increasing revenues, and since they are not increasing service by that much, why is it that they have to increase fares? Instead fares will be raised and bus service cut for the people who could least afford to have the cuts made. Meanwhile Rep. John Dougall says that it is great because people should pay more of the cost and taxpayers less which is the same stuff that comes out of many right wingers but ignores that taxes going to roads especially local roads. If UTA is going to raise fares it should do so on the most expensive routes to run the commuter runs. Routes from Utah and Weber counties that run to Salt Lake in the morning and back in the evening are some of the most expensive the UTA has. This is because there is a big capital expense in the luxury commuter buses on those routes that spend 75% of their day sitting and not earning money. Because these routes use special buses and are all expresses, rates should be raised on them so that it balances out for the distance traveled and the express service. Here is a radical concept of the UTA which comes from the business world. On the local routes how but lowering fares? That's right do something that might bring even more people to the buses and increase revenues that way. Or even do what some other cities have done and charge more for traveling during peak periods and give a discounted fare for traveling during off peak periods when more people are needed on transit. These are some pretty radical ideas that will probably not make it. The way the philosophy works at transit agencies (unfortunately UTA is no different from most) is that they can't lower fares because they will loose money. What they are saying basically is that no one new will be attracted to riding the buses so they will loose money. So in other words, people prefer to ride rail not the buses which is common knowledge. Of course one the problems making this situation truer on UTA is the fact that bus service is not good outside the immediate downtown area. Some buses make there last trips at 5pm (11 Inbound) while nightride starts too early at 7:00PM. If UTA is going to improve bus ridership it needs to look at some of these situations. Next year UTA is going to ask for a tax increase to speed up construction of TRAX lines. While I support this because TRAX does attract choice riders, it makes it hard for UTA to justify increase taxes when it is cutting bus service and increasing fares. Part of the last increase was supposed to increase bus service but the only real increases has been limited Sunday service. If UTA is going to cut service and raise fares, UTA needs to make changes from within. There needs to be more focus on customers at UTA to increase ridership and revenue. When Will Changes Come to Bus Lines? Last year UTA did a study of all the bus routes in Salt Lake County and they where planning to do massive changes in the bus system over this year. However, UTA has put off many of those changes but still plans to do most of the changes in the next year. However, few people know exactly what these changes will be. UTA has not released the details of the plan or what kind of changes will take place. The problem with most of these plans is that they are made up by consultants that never rode the bus system and don't have a clue about the who what where and why people ride the bus. Orange County, California reorganized their bus system a few years ago on the advice from a consultant yet after only six months they started returning to the old system because of the negative effects it had on thier system. I am not putting down all consultants (after all I am breaking into the business myself), but when the consultants only go by the "numbers" and do not find out the information on riding habits, the changes will not help out the UTA's customers: the riders on the buses and TRAX. I am not saying that there is not the need for changes in the bus system, on the contrary there does need to be changes. Currently the bus system is in the immediate Salt Lake area is largely based on old streetcar lines that buses replaced 70 years ago! The times have changed and its time for the bus system to change. However, the system needs to change in order to make riding the system easier for the customers of the UTA. UTA needs to work with its customers to make a better transit system that will not only work for existing riders, but also be more attractive to choice riders. Will Utah County Ever Gets it Act Together??? Well there is always news on the transit front coming out of Utah County but usually its it pretty nutty or just plane dark ages thinking. I actually thought there might be some hope when Utah County decided to pull out of the Mountainland Association of Goverments which had a very rural planning attitude and decided to start its own association, however the more things change in Utah County the more they stay the same. Utah County is working on a vote to increase the sales tax to support transit just like Salt Lake, Davis and Weber counties did a few years ago. Part of the measure will fund the construction of the commuter rail line from the Utah County border to Provo and Payson. However, some politicians don't want the transit agency to get the funds until it is ready to build the system so it wants to put the money into freeways. However there is still some politicians down there that still have the no body rides transit attitude and wants no money at all invested in commuter rail. This attitude is so backward because even before the rapid rise in gasoline prices ridership on Utah County bus routes especially the commuter routes have been going through the roof. This despite the system is not that good and still could use a lot of improvement. Of course the main newspaper the Deseret News which is now has a board headed by a developer by the name of Ivory is not helping matters only producing negative articles. There have been several anti-commuter rail editorials in the paper one being written by and Economics instructor at BYU. Unfortunately I don't see any changes at the Deseret News until Ivory is gone from their board. Of course the best course of action is to hit the newspaper with as many well written letters to the editor as possible telling the truth about rail. Hopefully some changes will come in Utah County as gas prices continue to be high and I-15 becomes more of a bottleneck. Transit will work in Utah County as it has proven with the rise in ridership.